The Soul Motion School was created as a means to further engage the essential spirit and mastery of Vinn Arjuna Martí’s life’s work, Soul Motion. The curriculum presents a body-based understanding and perception of present moment aliveness. The language of the body is spoken through creative expression, dynamic relationships with yourself and others, and the still voice of dialogue with all that is seen and unseen. The Soul Motion School comprises a circle of experienced Soul Motion teachers who will bring their own distinct points of view and approaches to this body of work. 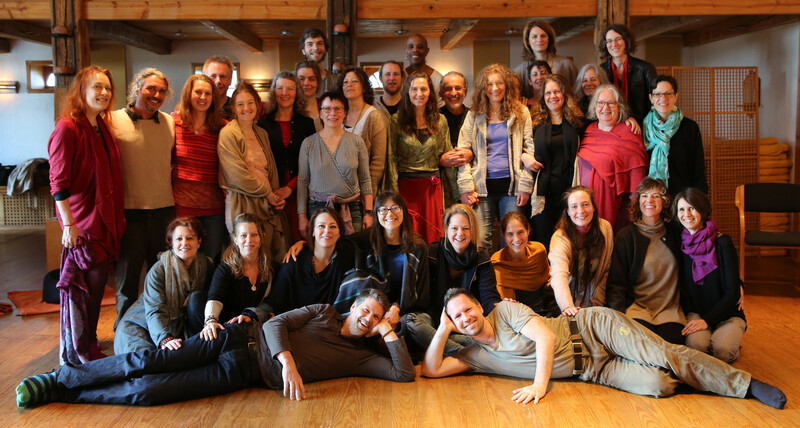 Graduates and Faculty of the Soul Motion Training 2016 in Germany. Soul Motion is a practice, a philosophy and a pathway to coming home to the master teacher within us. From this place we all become greater leaders, more influential in our ‘non-doing’ – in our being – because we are in a state of relaxed presence. Relationships blossom, our mind becomes more focused and our communication is enhanced. In the everyday dance of home life and business, Soul Motion principles cultivate a culture of heart and soul centered leadership. The Soul Motion School offers a Soul Motion Teacher Training to deepen and integrate this practice into your every day and also for those who wish to become a Certified Soul Motion Teacher. Faculty is Artistic Director and Founder Vinn Arjuna Martí, supported by Michael Molin-Skelton, Aletia A. Alvarez and Edgar Spieker. Please read more infos about the Soul Motion School on the Soul Motion Website www.soulmotion.com.